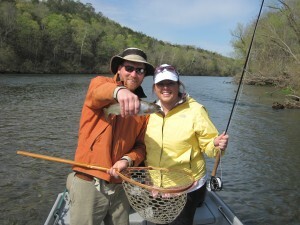 On Saturday Maggie and her husband, Chris, joined us for their first ever fly fishing adventure. They had never cast a fly rod nor seen a trout fly. 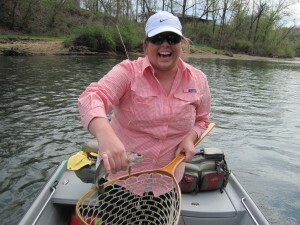 The Norfork River offered up some good water conditions and it was a beautiful spring day for some fly fishing lessons. Chris had watched some fly casting videos on YouTube and with just a little instruction from Bo he was hooked-up on his third cast. After a nice river lunch Bo rigged the rods with a new fly he calls “Trout Candy” and both anglers got on some serious numbers. At the end of the day Chris hooked up a beautiful Cutthroat Trout but we failed to get a good photo. Regardless it was a good way to conclude Chris and Maggie’s first day of fly fishing. Does Maggie look like she had any fun catching her first trout on fly?